The first composite development barrela sample of the fuselage structurefor the Boeing 787 Dreamliner program sat in its tooling fixture for less than three days before Boeing and its partners began to cut it apart. "This is not a museum piece," said Walt Gillette, vice president of Engineering, Manufacturing and Partner Alignment for the 787 program. 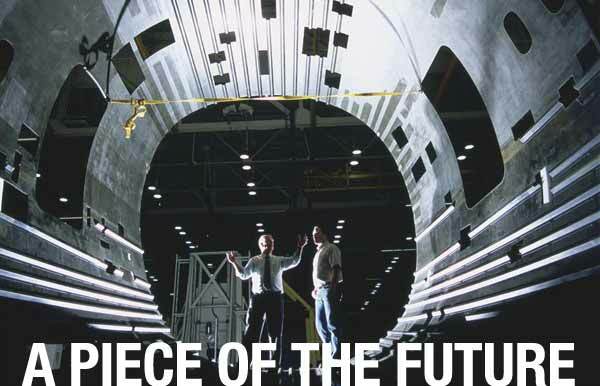 "We built it so we could prove our concepts and learn better ways of producing large monolithic composite structures." Learning, in this case, required cutting pieces from the barrel to verify the structural integrity. The pieces, more than 50 in total, have told the developers that they got it right. "The pieces are being used both to examine the quality of the part and to examine more closely some of the part features," said Laura Bogusch, project manager for the one-piece barrel development. "We looked at the barrel using nondestructive methods, and this will ensure that our tools and the processes worked." The results so far, Bogusch said, "have met our expectations and in some cases exceeded them. We have identified a number of things we want to do differently with the next barrel, but most importantly we have proven we are on the right track. Now it's just a matter of refining and perfecting." At the start of the barrel development program, the team faced three categories of challenges: building the barrel, curing the barrel, and developing post-cure processes. Engineers have long known that composites offer better performance properties than metals for pressurized vessels like large airplanes. They are corrosion- and fatigue-resistant. The challenge has been bringing the cost of making composite structure in line with commercial realities. "It's not as easy as making the same pieces you would make with aluminum out of a different material," explained Frank Statkus, vice president of Advanced Technologies and Processes for the 787 program. "You have to design for the material you are using. In the case of composites, that means you want a large, integrated piece. That's how you take advantage of this material." That's what led the team to design a single-piece barrel with integrated stringers (longitudinal supports). The first section built was the 22-foot-long section that represents the farthest-aft portion of the passenger cabin. In addition to developing new design approaches, it also meant developing new tooling and manufacturing processes. "This had never been done before," said Mark King, also project manager for the one-piece barrel development. Composites have been used for military and business jet fuselages but not for full commercial fuselages. To optimize chances for success, King said the team brought together many talented individuals who worked together to create and execute the plan. "There were several unknowns that could not be understood until we had completed a full-scale article," he said. "We were fairly confident, but seeing the finished proof and then examining it in detail was a huge payoff for an incredibly intense effort." The specifics of the processes and procedures worked out by Boeing and its partners for the 787 development effort are considered intellectual property, and details are not shared widely. While Boeing has a long history of working with composite materials, the detailed process for properly curing a large piece of composite structure in an autoclave can be tricky. The piece has to be equally heated and pressurized to ensure the right result. The 787 Dreamliner program recently reached another two agreements for orders. 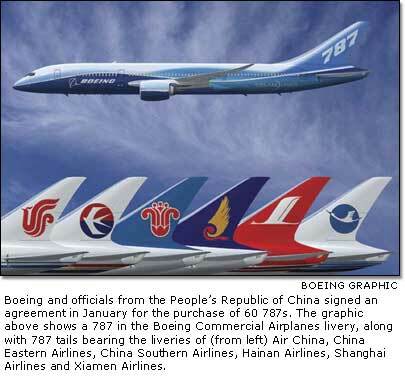 Boeing and officials from the People's Republic of China signed a preliminary agreement for the purchase of 60 787s. The Chinese jets will go to Air China, China Eastern Airlines, China Southern Airlines, Hainan Airlines, Shanghai Airlines and Xiamen Airlines. Each carrier will receive its first 787 in time for the 2008 Beijing Olympics. 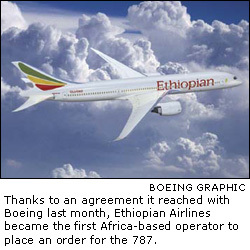 In addition, Boeing reached a preliminary agreement with Ethiopian Airlines for five firm orders. The pact makes Ethiopian the first Africa-based operator of the super-efficient jetliner. The first Ethiopian airplane is scheduled for delivery to Addis Ababa, the airline's home base, in 2008. With these agreements, Boeing has 191 firm orders and commitments for the 787 from 15 airlines. "The significant market interest in this airplane since launch less than a year ago has really been gratifying," said Mike Bair, vice president and general manager of the 787 program. "Clearly we are working on the right airplane for our customers." The greatest challenges with the cure process were fitting the part into the autoclave with less than 3 inches of clearance, achieving an even heat-up on a tool and a part this size, and maintaining vacuum integrity on a tool with a surface area of more than 3,500 square feet, Bogusch said. "We had team members who were able to use analytical tools to predict our success, and that gave the team more confidence," she said. In December, the first development barrel rolled out of the autoclave at Boeing's Developmental Center in Seattle to the cheers of more than 100 engineers and machinists. Once unwrapped, it appeared the team got it right. But appearances aren't enough. A series of rigorous tests lay ahead to ensure the accuracy of the processes. First, holes were drilled into the part to help locate frame (internal structure) components to be installed later. Next, the team looked at several methods for cutting out windows and doors. Final analysis on which methods worked best is under way. Finally, they tested the painting process. As expected, they encountered no problems. After the barrel's public debut in January, development work quickly resumed. At one end of the barrel the team began installing frames. At the other end, they began extracting small pieces for further testing and analysis. More than 60 pieces eventually will be cut from the barrel. "Each piece will teach us something about the fabrication process, the cure process, or our nondestructive inspection techniques," King said. "It may seem like a lot of pieces, but it is very important the team knows how close we are to meeting all of the engineering and quality requirements we will need to meet in production." The program intends to build seven more one-piece barrel sections. All of the barrels will have pieces cut out of them for test and analysis. "It's great to look at these pieces of history," Gillette said, "and know that the Boeing team is again shaping a dramatic new approach to bring value to our customers and their passengers. "But we can't just look at it. We have to analyze it, learn from it and continue to improve the way we build our product so we gain the competitive edge we expect from the 787."